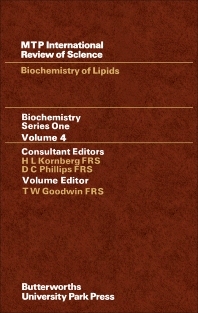 MTP International Review of Science: Biochemistry Series One, Volume 4: Biochemistry of Lipids focuses on the processes, methodologies, reactions, and approaches involved in the biochemistry of lipids. The selection first elaborates on the enzymes of sterol biosynthesis and lipids in glycan biosynthesis. Topics cover polyprenols and glycan biosynthesis in green plants; polyprenols and glycan biosynthesis in yeasts and fungi; undecaprenol and bacterial wall glycan biosynthesis; methods of investigating particle-bound enzymes of sterol biosynthesis; and relationship of the multi-enzymic synthesis of cholesterol to other microsomal processes. The text then elaborates on the biosynthesis of saturated fatty acids, dynamic role of lipids in the nervous system, and biosynthesis of unsaturated fatty acids. Discussions focus on anaerobic pathway of monoenoic fatty acid biosynthesis, exchange of brain lipids, lipids and transmission in the nervous system, fatty acid synthetase, and lipid distribution within the nervous system. The manuscript examines halogenated sulphatides and prostaglandins, including identification of prostaglandins in organs and body fluids, estimation of prostaglandins, and occurrence of halosulphatides in membranes. The selection is a valuable reference for researchers interested in the biochemistry of lipids.